Batting: Dickwella 42 off 72 balls. Bowling: Shannon Gabriel 3/52 in 15 overs, Jason Holder 4/19 in 16 overs, Kemar Roach 2/30 in 12 overs. Batting: Kemar Roach 23 off 37 balls, Shane Dowrich 16 off 31 balls, Jason Holder 15 off 30 balls, Cummins 14 off 37 balls. Batting: Kusal Mendis 25* off 38 balls, De Silva 17 off 29 balls, Gunathilaka 21 off 30 balls. Pitch appeared to be the same on Day 3 as few bare patches and grass was going to aid bowlers in getting inconsistent bounce and rattle the batsmen. Dickwella and Roshen Silva came out to bat and Gabriel & Roach started it off for West Indies. Bowling with excellent line and length, these two bowlers were clearly troubling the batsmen. This accuracy did not go unrewarded as few overs later Gabriel snuffed out the wicket of Roshen Silva. Perera joined Dickwella. Both batsmen played sensibly and steered clear of West Indies strike bowlers; Gabriel and Roach. The West Indian captain, Holder now brought himself and Cummins into the attack. 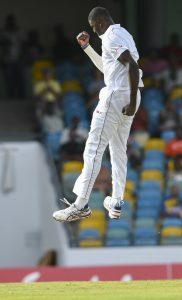 Due to his height and bowling stance, Holder was getting good bounce off the pitch. Both batsmen stayed strong for some time but Holder finally got the wicket of Dickwella. Perera and Lakmal were present on the crease. This meant that the lower order was now exposed for West Indian bowlers to feast on. 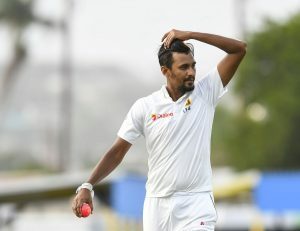 Holder got Lakmal in his next over, followed by Rajitha of whom he shattered the stumps to claim his 4th wicket of the match. At this point, Sri Lanka were 9 wickets down with 150 runs on the board. The Lankans needed at least 56 runs to get in the lead. But, unfortunately their luck ran out as Perera got run out in the last over. Sri Lanka were all out on 154 runs and were trailing by 50 runs. From the state of the pitch and the performance by the Sri Lankan batsmen, it was obvious that batting on this pitch would be difficult for West Indian batsmen. Devon Smith and Brathwaite came out to bat while Lakmal and Kumara started it off for West Indies. Smith’s batting woes continued as he fell for a duck much to the joy of the Sri Lankan captain, Lakmal who got his team to a dream start. Powell joined Brathwaite. But, Lakmal was in no mood to let West Indian batsmen build up a partnership as he got Brathwaite in his very next over. Shai Hope joined Powell. But, Kumara struck in the next over as West Indies lost their 3rd wicket for 9 runs. Roston Chase joined Powell. Lakmal and Kumara continued to bowl and the Sri Lankan captain got the wicket of Roston Chase. Powell finally got out in the next over as he fell to Kumara. At this point, West Indies had lost half of their wickets and only scored 14 runs. The saviours of the 1st innings, Holder and Dowrich were now present on the crease. Both batsmen steadily started to mount runs and defy the Sri Lankan bowlers. This forced Lakmal’s hand as he brought Rajitha into the attack. 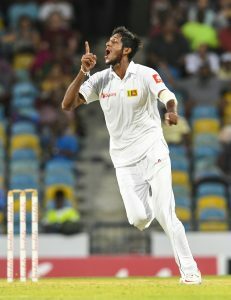 Sri Lankan captain’s tactic worked as in his very next over, the young fast bowler struck twice in 3 balls to get rid of Dowrich and Bishoo. Roach joined Holder. But, this partnership couldn’t thrive as Rajitha finally got the big wicket of Jason Holder. Cummins joined Roach. And, after a nice little partnership of 26 runs, Perera got the wicket of Cummins and now West Indies were 9 wickets down for 82 runs. Gabriel joined Roach. This is when Perera’s effort to field the ball got him into an injury and was rushed to the hospital with the umpires calling the dinner break. Play resumed after dinner and after adding only 4 runs to the total Gabriel departed; courtesy of Sri Lanka’s excellent fielding. With West Indies all out on 93 runs, Sri Lanka now needed 144 runs to win this match and level the series. So 144 the magical figure the Lankans are after with one man short. Chance for a historic victory for an Asian team at the Kensington oval at Barbados. With batting on the 4th innings looking a challenge Sri Lankan seem to be getting in to a very difficult position in the match with their 1st innings show. The fielder concern was Kusal Perera. Thankfully he was conscious and able to move slightly. He has been removed from the ground for medical care. Wish him a speedy recovery. Udawatte and Gunathilaka walked out to bat while Roach and Gabriel started it off for West Indies. Gunathilaka made a brilliant start but Udawatte couldn’t hold on as he got out on a duck off Roach’s bowling. De Silva joined Gunathilaka. Both batsmen added another 21 runs to the total before Holder brought himself into the attack. 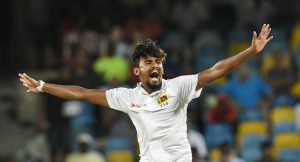 The West Indian captain struck straightaway as he took the wicket of Gunathilaka and Sri Lanka were now 2 wickets down for 30 runs. Kusal Mendis joined De Silva. Both batsmen added 18 more runs to the total as Sri Lanka now needed less than a 100 runs to win this test. The pair was looking solid, but Holder continued with his overs and got the wicket of De Silva. Sri Lanka were now 3 wickets down and still needed 96 runs to win. Roshen Silva joined Mendis. 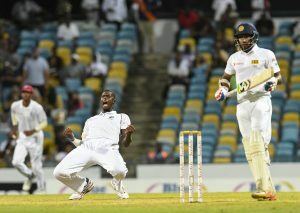 But, Holder seemed to be on fire as he got the wicket of Silva in the very next over. Dickwella joined Mendis. 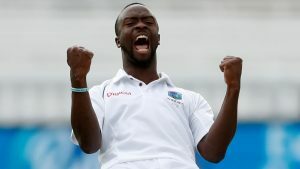 Both batsmen narrowed the target down to 71 runs and then Holder shattered the stumps of Dickwella claim his 4th scalp. 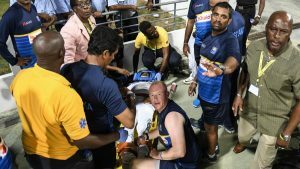 West Indies now needed only 4 wickets to win, considering the fact that Kusal Perera was still in the hospital. Both batsmen held their ground till rain stopped play and stumps were called. Join Allsportspk tomorrow for Day 3 of West Indies Vs Sri Lanka 3rd Test.